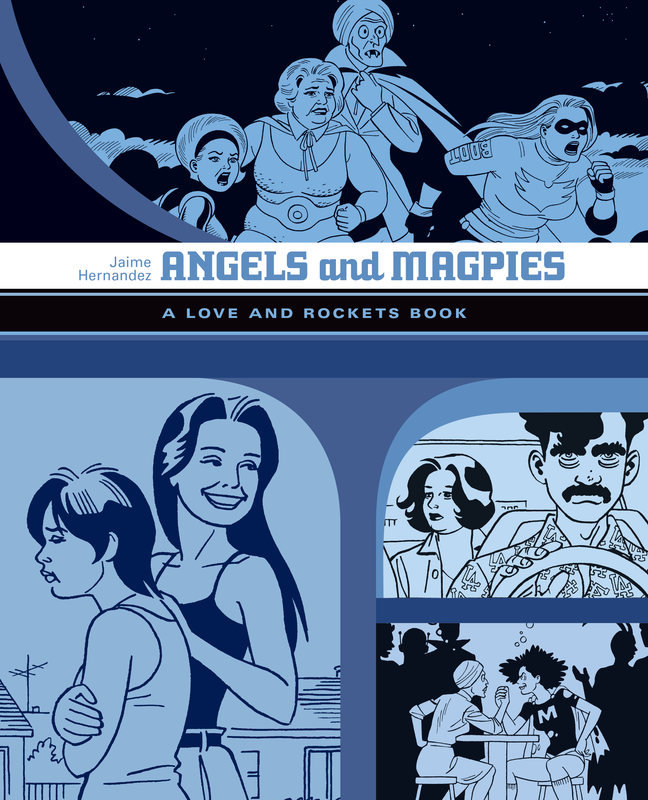 Angels and Magpies is the sixth paperback collection of Locas stories by Jaime Hernandez, continued from the previous volume, Esperanza. 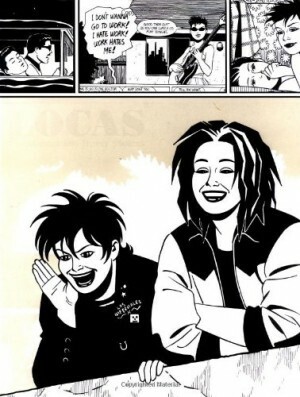 It collects everything published in Love and Rockets: New Stories between 2008 and 2011, and also includes the Maggie and Rena Titañon story that appeared in the New York Times in 2006. This volume begins with that NYT strip ‘La Maggie, La Loca’ which was originally published as a single weekly colour page, but is here reprinted in grey tones, which are occasionally more difficult to read than plain black and white. Because of its squarish shape, rather than fill the page the strip only occupies the top three-fifths, and a second strip ‘Gold Diggers of 1969’ is broken up into a two-tier layout to run underneath. It makes the pages feel like a Sunday paper and it’s a nice thematic matchup because one story features Maggie as an older woman looking back at her past, and the other is a look at her as a toddler, but purely visually this layout doesn’t work well. 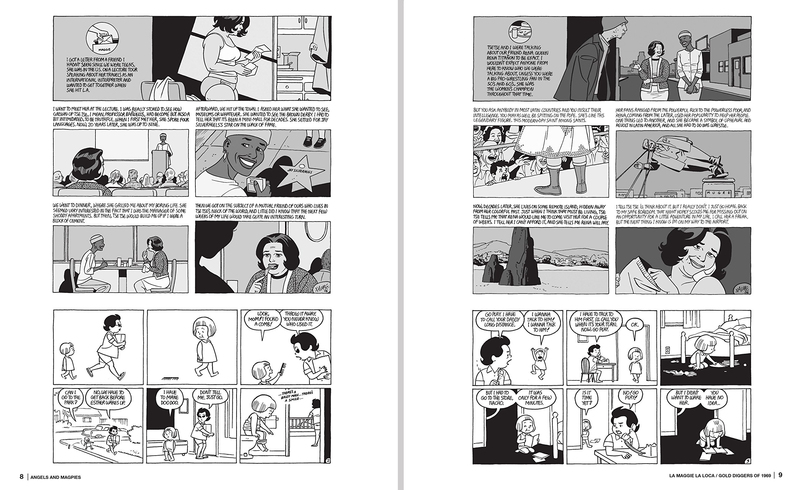 Both stories look cramped, with much smaller panels than the others in this book. The extra wide margins just add to the compromised feeling of little pictures floating awkwardly in space. Next is Gods and Science: Return of the Ti-Girls, an inventive and beautifully drawn, dynamically-choreographed superhero extravaganza reviewed in detail here. 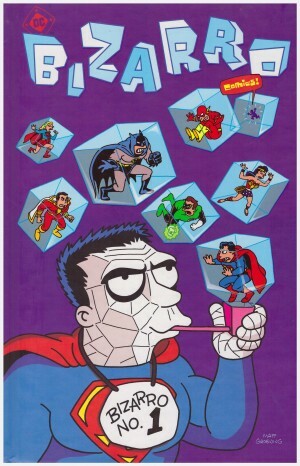 Hernandez added an extra 30 new pages to his original 100-page story to expand several key scenes, and this is the same revised version. The exhilarating anything-goes feel of this story harks back to the days of ‘100 Rooms’ or ‘Las Mujeres Perdidas’ but things come back down to Earth in the other big story in this collection, Love Bunglers. 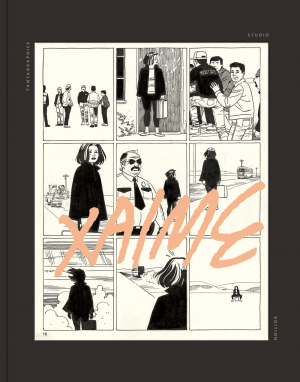 Universally hailed as Jaime Hernandez’s greatest achievement in his thirty-year career and one of the best graphic novels of all time, Love Bunglers sees Maggie and Ray’s long and tortuously on-again, off-again relationship status finally resolved for better or worse, as a number of buried secrets from the past come up for one last airing. See the detailed review here. Angels and Magpies is a fabulous collection showcasing all the different aspects of Jaime Hernandez’s storytelling styles in one book like a greatest hits album, and for 270 pages on crisp white paper that will keep you absorbed for hours, it’s incredibly good value.